You know those really healthy snacks that people claim are sooooo delicious, when really they just taste like cardboard, or a stick, or a bowlful of gruel? This is totally not like that. 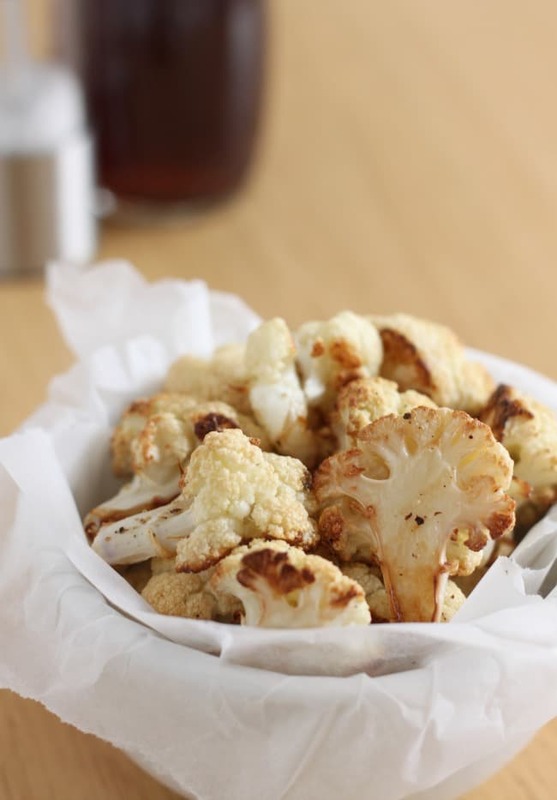 Roasted cauliflower is low carb and low calorie, buuuut it also tastes amazing – and I am not generally one to enjoy healthy alternatives to not-so-healthy dishes. I usually prefer the not-so-healthy version (as I’m sure most people do) – but this salt and vinegar roasted cauliflower definitely holds its own against a bag of greasy salt and vinegar crisps. 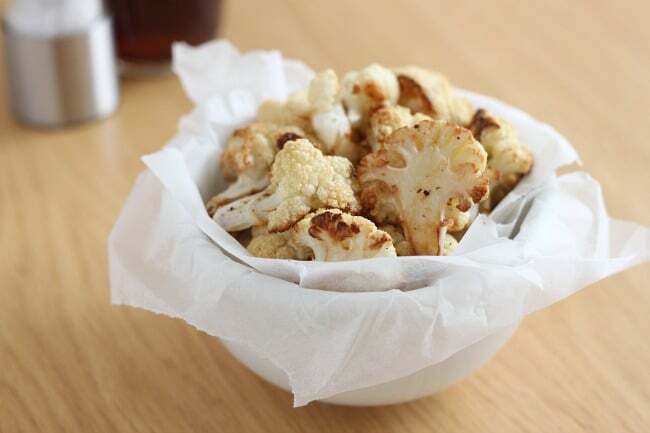 In fact, I really shouldn’t even be comparing the two, because rather than viewing this roasted cauliflower as a low carb alternative to crisps, I want you to recognise it as an amazing snack in its own right… can you tell I’m passionate about this cauliflower? I actually used to name cauliflower as one of the two vegetables that I really couldn’t stand. Whilst I still avoid peas wherever possible, roasting honestly transforms cauliflower from a bland, watery vegetable to something that I would quite happily snack on all day long! For a lot of people, roasting isn’t a cooking method that often springs to mind for cauliflower, but it works unbelievably well. The very edges of the florets crisp up slightly and the undersides become nice and caramelised. It bears no relation at all to the soggy vegetable I was used to. 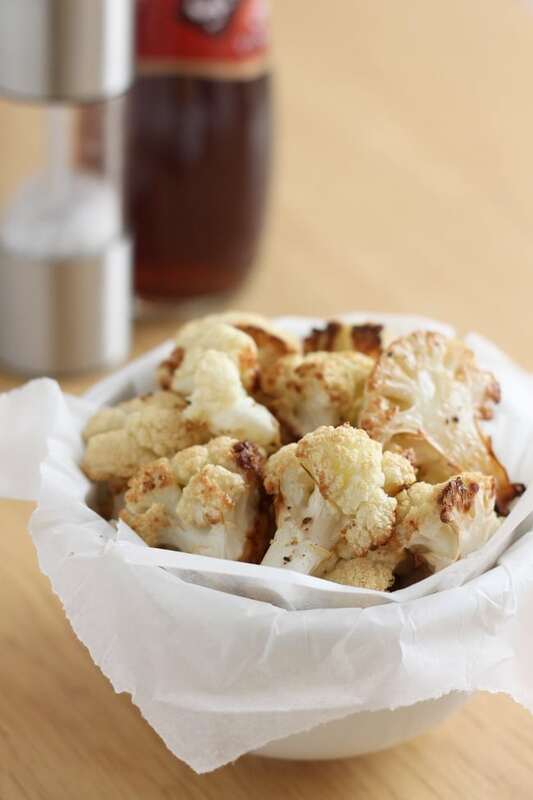 And of course, if you’re not feeling the whole ‘snacking on cauliflower’ thing, roasted cauliflower also works really well as a side dish for a roast dinner (perhaps without the vinegar!). Since cauliflower has a fairly mild flavour, it’s great for dressing up with whatever flavours you fancy. Try sprinkling it with your favourite herbs and spices before roasting to give any number of flavour combinations (my favourite spice, smoked paprika, would work really well!). Make sure you share your favourites with me! Remove the leaves and the base of the stalk from the cauliflower, and separate the head into bite-sized florets (cut any large florets in half). 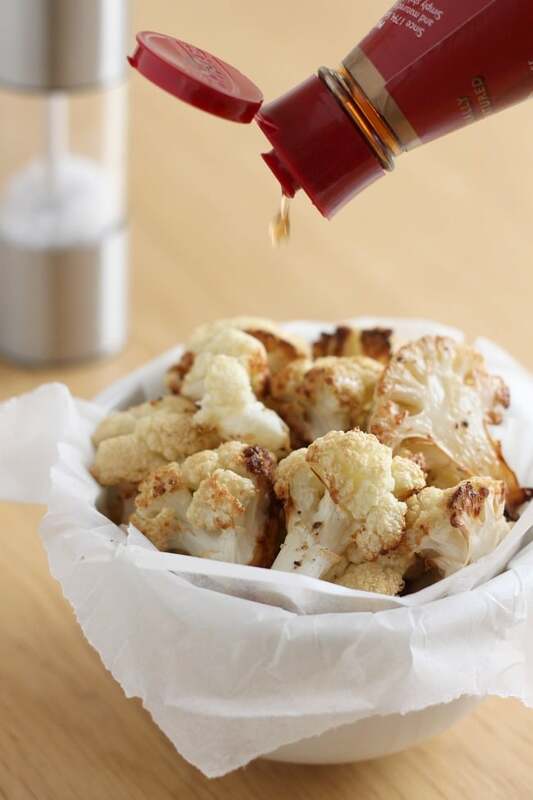 Toss the cauliflower in the oil and vinegar, and lay out in a single layer on a baking tray. Sprinkle with a little salt and black pepper, and roast for around 25 minutes at 190°C (Gas Mark 5 / 375°F), until slightly crispy. Add more salt and vinegar to taste, and serve warm or cold. 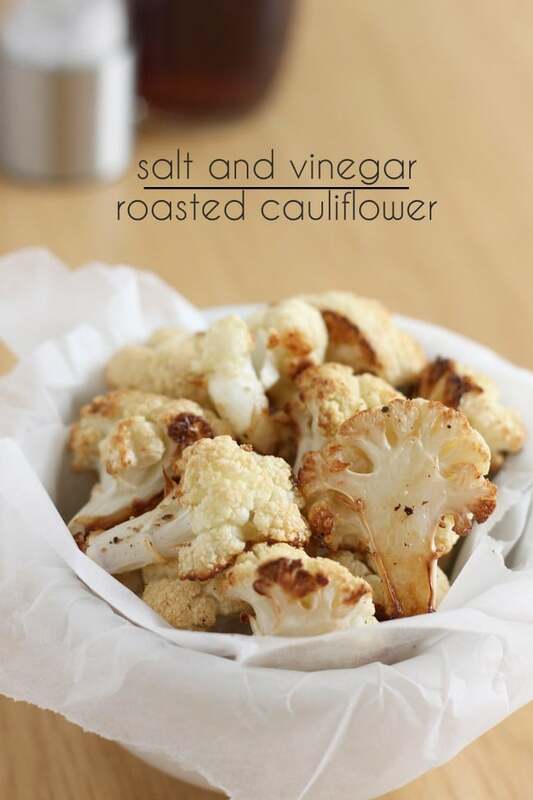 Are you a fan of roasted cauliflower? Try my low-carb cauliflower pizza! I’ve stumbled over your gorgeous recipe and love it! We just can’t have enough cauliflower recipes. Yes for me smoked paprika would probably also be my favorite seasoning. I lined my baking sheet with foil, then tossed half way thru baking. Served it with marinara sauce and meatballs. Very tasty. 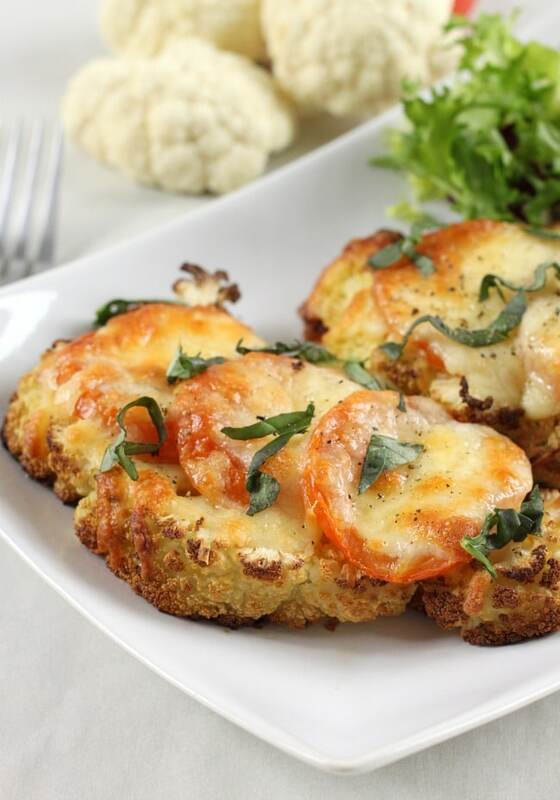 CAULIFLOWER PIZZA! !, That food is very interested and look so very hungry. I’m learning to eat a lot of vegetables that I thought I didn’t like. Roasting and seasoning them makes such a difference. I love balsamic, but I will try this. BTW, you are one of the only Brits I know who admits to not liking peas! My British partner will put them in anything! He’s pea crazy! Good morning! Just letting you know that I featured this recipe in my 25 Deliciously Healthy Low-Carb Recipes Round-Up from November 2015. Hope a lot of my readers will come over here and try it! OMG. Have I mentioned recently how brilliant you are? Becca, this is unbelievably delicious! Thanks for posting. I had a third of an enormous cauli to finish and saw your recipe pop up – perfect timing. Also tossed some asparagus with basalmic vinegar and a bit of olive oil and roasted that at the same time to make use of the oven heat. if you are looking for other cauli ideas, Jamie O has an excellent recipe for cauli risotto with a chilli pangrattata (not sure if that’s one word or two!). Not exactly low-cal or carb free, but damn fine nonetheless. Love salt and vinegar together.. definitely need to try the combination like you suggest on some roasted cauliflower! 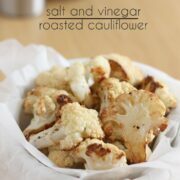 My family loves cauliflower, and although I’ve roasted it before, I’ve never tried it with vinegar. I need to make this! Hooray for roasted cauliflower! We just powered through a head of it a few days ago. Salt and vinegar sounds like such a good combination too. I love salt & vinegar anything. It’s so British and so good. Can’t wait to try this cauli awesomeness! I’ve tried buffalo cauliflower (SO GOOD! Butter and hot sauce! Just do it!) but hadn’t thought of vinegar. Thanks for the idea! Oh yum! Cauliflower used to be one of my least favourite vegetables, and my husband still doesn’t really like it, yet somehow our 5 year old son loves it! I have no idea how that happened. But I think I will have to make this to snack on…looks delish! Cauliflower is definitely underrated! You can do so much with it and the flavor is great. I love what you did with the pizza – Yum!! The absolute worst snack food every made is rice cakes. I don’t care what flavor they put in them they still taste like Styrofoam. No!! I’ve never eaten Styrofoam but I’m sure it would taste like rice cakes. Haha! Totally agree on the rice cakes! I actually love rice cakes. I have one every morning with my tea. Spread with cream cheese and/or crunchy peanut butter they are quite tasty as well as being low calorie. This sounds really good. I don’t have malt vinegar but I’ll put it on my list. Usually I roast cauliflower with Cajun seasons and minced garlic after a light coating of olive oil and usually it’s with other veggies too for a complete dinner. Having this recipe of yours as a snack sounds great when company comes!